What are the clinical features of hemophilia? 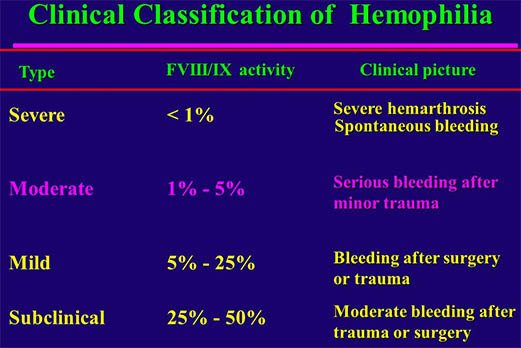 Hemophilia is a coagulation disorder which manifest as increased bleeding due to defective clot formation.In mild disease there is infrequent bleeding that is secondary to trauma. In severe cases there is haemarthrosis, bleeding into soft tissues, muscles which can be either spontaneous or secondary to minor trauma. Earliest bleeding manifestation are seen when the child begins to crawl or walk. Some people manifest it as increased bleeding after minor surgical procedures. 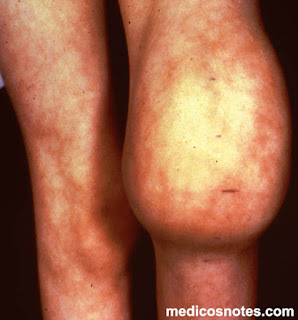 Severe forms as recurrent haemarthroses are seen in severe factor deficiency. Common sites of joint bleed are knee,elbows,ankles, hip and shoulders. Painful local swelling and erythema can occur due to superficial bleed. Joint bleed may lead to inactivity decreased joint mobility, neutral fixed position may lead to contractures. Chronic haemarthroses can lead to synovitis. Vicious cycle of bleeding lead to deformity. Large bleed in to the muscle will lead to Compartment syndrome.The haematomas in distal parts of limbs leading to compression of arteries,veins and nerves. Dangerous sites of bleeding are Oropharyngeal spaces, CNS, retroperitoneum - These bleed are very fatal. Pseudotumours in long bones of lower limbs can damage femoral nerve due to pressure effect. Haematuria in the absence of genito-urinary pathology can occur in hemophilia. Clinical manifestations usually correlate with activity of residual clotting factor.